But don’t climb the peaches. They’re useless that way. It’s easier for the two of us to fly than the two of them and their four kids, so it had been awhile since they’d all been here. There’ve been changes in the yard just this year; the two older boys ran out back to explore. I named each fruit tree going around one by one. After that visit, my daughter-in-law told me that Parker wanted to eat apples all the time and he wanted them cut across the equator so all the seeds showed and he wanted to go on walks to plant those seeds so they could grow into great big apple trees where they lived so that everybody around them could get to pick and eat apples like that, too. He wasn’t more than politely impressed with my peaches or cherries (yet) but that big old Fuji, that one was near and dear to his heart. And the kids could climb it, too, though I didn’t think of it at the time and they didn’t think to ask. It wasn’t till later that I tried to picture any good climbing trees near them and couldn’t come up with any, and I can imagine it didn’t occur to them that one even does such things. It’s not terribly scary high and it is pretty sturdy. 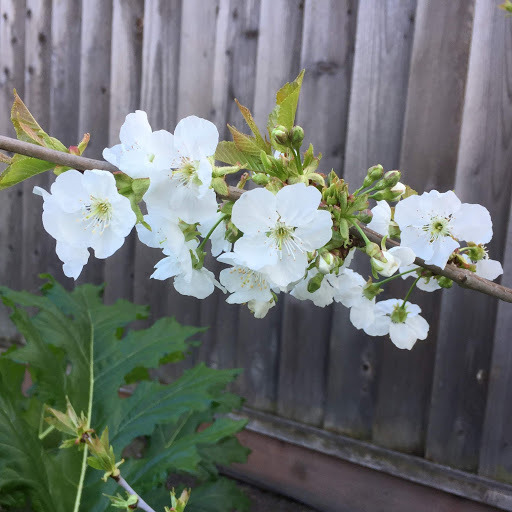 The second cherry, the tart English Morello, is really putting on a show this year. 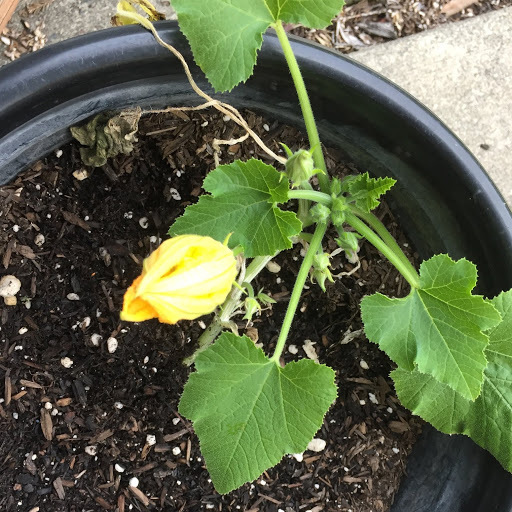 Some of you may remember: this is the one that the spring after I planted it was nearly killed by–something, and I never saw anything going at it and couldn’t figure out what, but its new leaves got chomped on and then entirely disappeared practically overnight; when it tried to put out a second set, those went down to the nubs, too. My bare root had become a bare everything again. I finally decided whatever it was had to be nocturnal and I went out at night with a flashlight. The entire tree was utterly engulfed in swarms and even multiple layers of iridescent black and green Japanese beetles trying to push past each other to devour some faint morsel. I had no idea what to do–knocking them off and trying to stomp on them all was so gross and useless because there were constantly so many more, and pesticides meant killing the wildlife. The soapy water that I use to suffocate indoor ants and wipe away their scent trails (insects breathe through their skeletons) I didn’t want in the soil. Which meant that good friends scraped off their barbecue grill for me and gave me a plastic bucket of the ashes. I waited for the tiniest first sign of green and went out that night and doused the beetles with the stuff. They fell away from my tree instantly, gratifyingly, dying unanimously while fertilizing the roots those non-natives had stolen so much from. I repeated that scene till they didn’t seem to come anymore. But the sapling had already given it its all. It stayed bare. I thought that was the end of it. It took longer to come back on the third go-round and there were fewer and smaller leaves but it just wasn’t its time to go yet. Recovery wasn’t immediate, not that year and not entirely the next, but this year it’s already growing faster than it ever has. 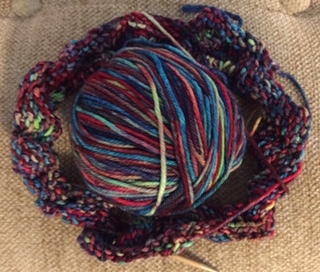 I spent lots of time today winding yarn, going over patterns, debating doing this vs that. It felt great to be planning something interesting. Those guys knew what they were doing. Yes, we had all that rain, but still, not only is it beautifully shaped, I’ve never seen it bloom as much as it is now. Which is what I was hoping for. P.S. And on a completely different note, as someone whose family did a camping trailer trip across the country and back in 1969 plus many other road trips, man, what we missed out on! An entomologist and his son have created an app to identify the bugs that wipe out on your windshield. Divvy it up, kids, your side vs. Susie’s and see who can win the most splats! A bug in the southeast likes the smell of exhaust pipes for laying eggs. Darwin rules. Make sure Dad passes on the right, too. You want your fair share. 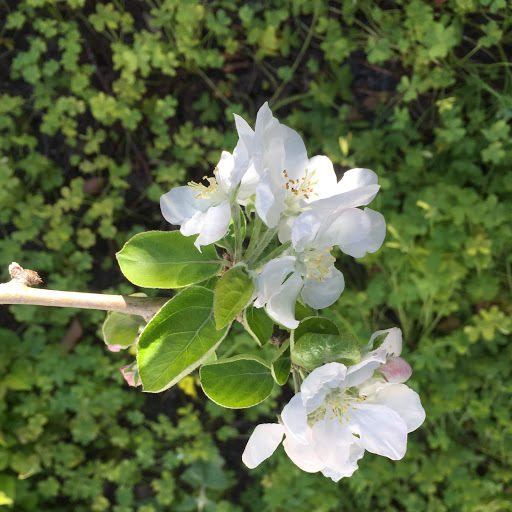 I love growing fruit trees. How many things that we spend money on remain with us, doing good, for the rest of our lives? Jennifer and her husband bought a house early last year about a half hour away, and sorry though I was to see them leave here, I asked her if they’d like one as a housewarming present, and if so, what type. 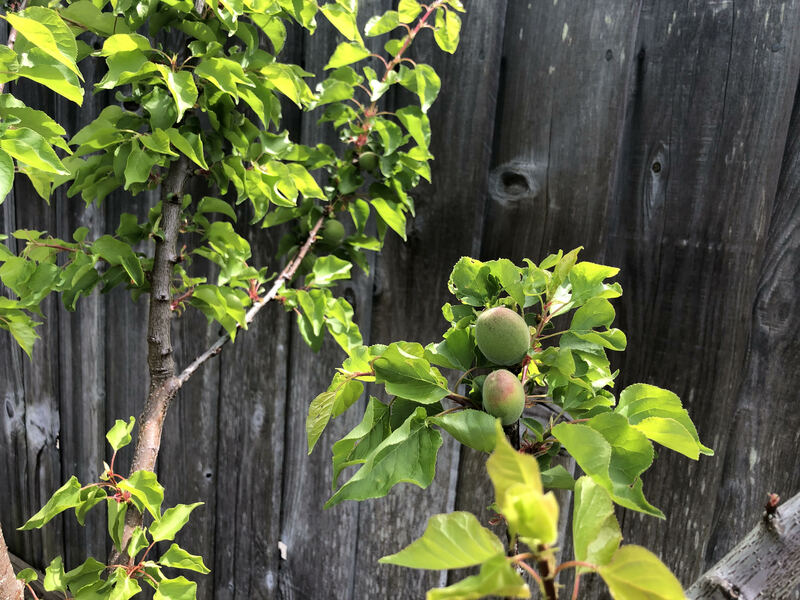 Turns out she had been wishing very much for an apricot tree, specifically one of the old wonderful Blenheims that are hard to find in stores. Yamagami’s had Royal Blenheims in stock. She sent me this picture today. I cannot begin to tell you how happy it makes me. 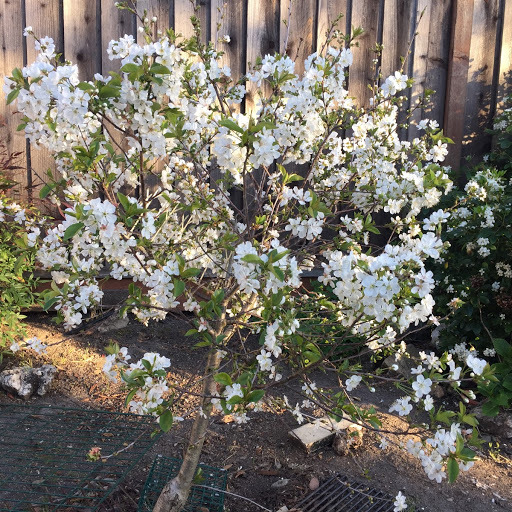 A few more days and the whole cherry tree should look like this and more. 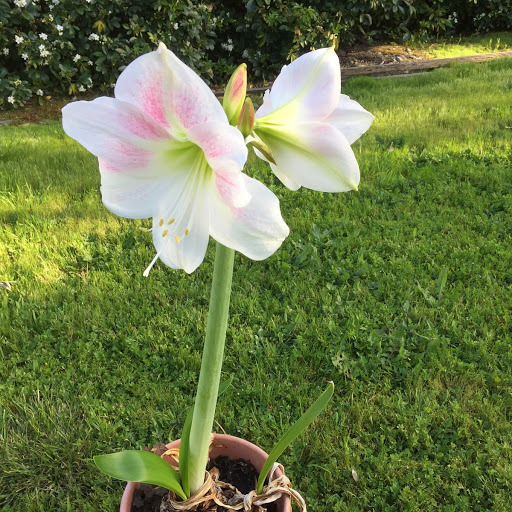 For my dad: an Apple Blossom amaryllis started opening today. 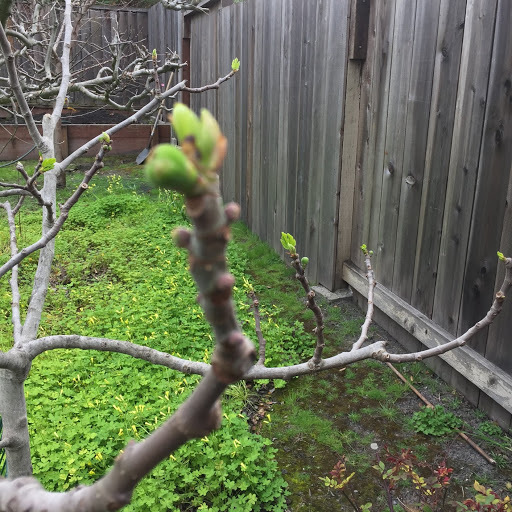 The Frost peach has been properly thinned, and so has hours of paperwork and housework that had needed to be out of the way before company comes next week. Sometimes even the disorganized have to crack down and get to it. The reward is that I found the bluetooth pendant for connecting my cellphone to my hearing aids–it had fallen behind the computer. 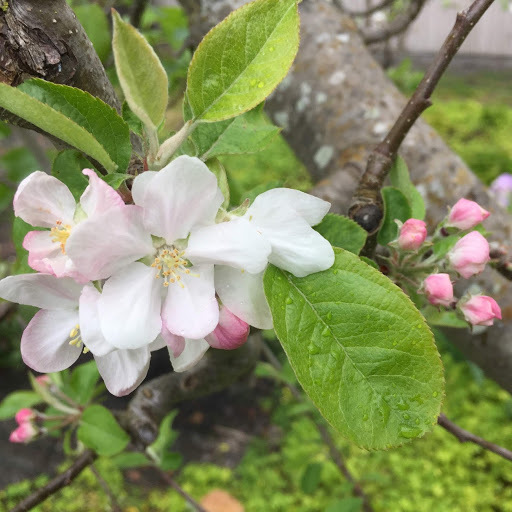 The Fuji apple started blooming two days after the Yellow Transparent, as it does every year. 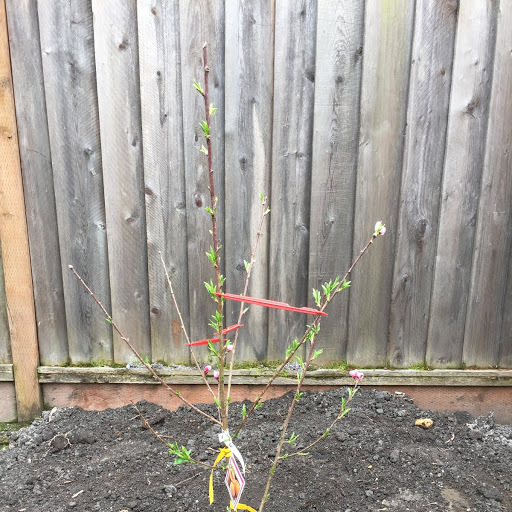 The brand new Frost peach tree I planted last month? I need to thin that pair to a single peach. (I know–already!) Always leave the bigger one. We’re having a Cooper’s hawk sighting nearly every day now. Cool. 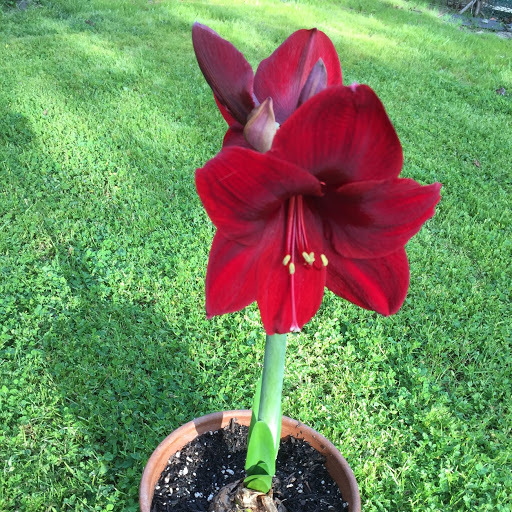 Another Red Lion amaryllis from my dad–here, the hawk’s gone now, let me give you a close-up. Love love love these. 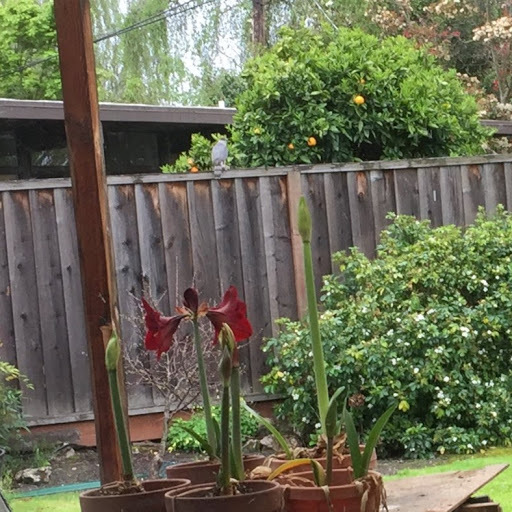 If you have an amaryllis with four or more leaves it should bloom the next year, too. 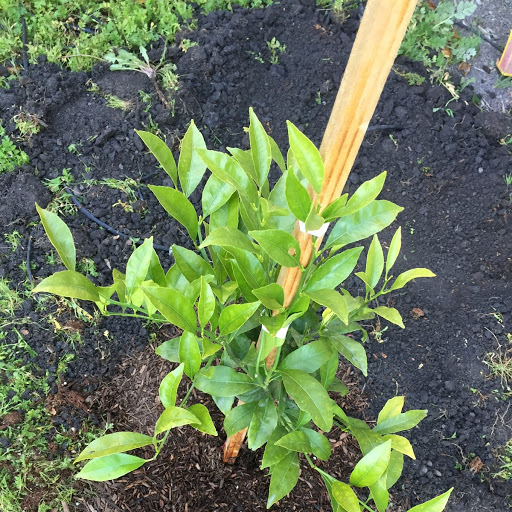 The ground is so wet that digging a big deep hole and finally planting the Kishu mandarin I got for Christmas was surprisingly very easy. Like pushing a shovel into Play-dough. If you live in non-citrus-growing areas and wish for a mandarin orange, plant this one in a pot to keep in or out depending on the weather. 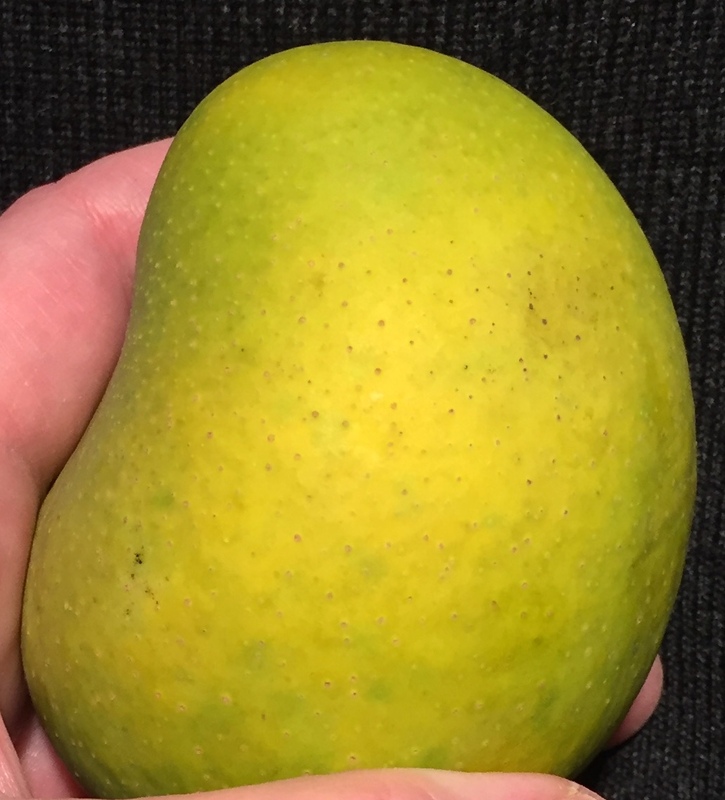 The tree is small and the fruit is golf ball sized, soft, seedless, and the peel pretty much falls off and you can just pop the whole thing in your mouth just like that. The fruit doesn’t ship well for grocery stores, you have to grow your own. It ripens months before my Gold Nugget and thus stretches out the season for us. Not to mention it will create more ground-bird nesting habitat out of what was a bare spot. 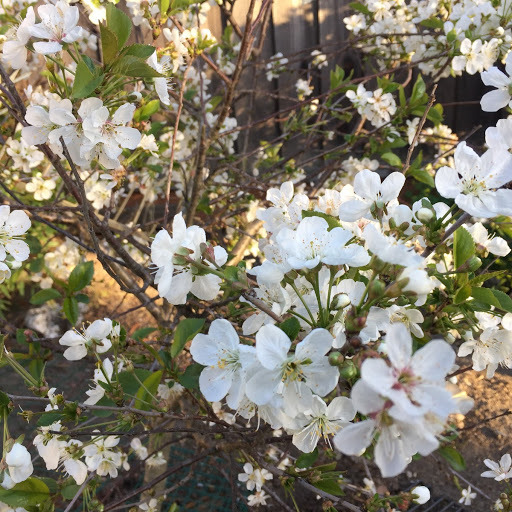 Today was a perfect spring day and the Sungold cherry tomato that I planted in 2017 burst into even more blooms. Three years! 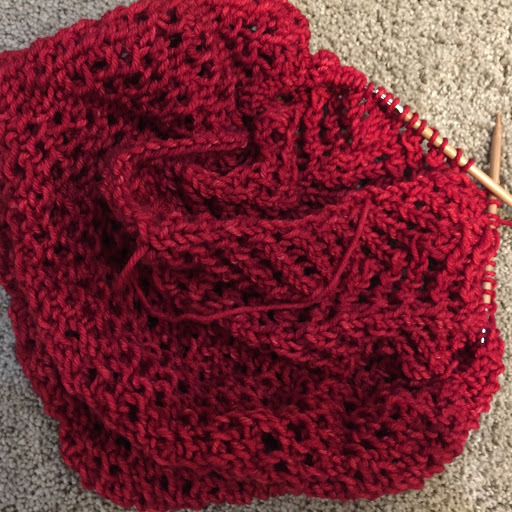 And to repeat the Red Lion red theme, while listening to two two-hour sessions of the General Conference of the Church of Jesus Christ of Latter-Day Saints, I got ten repeats done on this cowl; I can get one last one out of this skein and then that’s it. There will be two more sessions tomorrow, so it is time to pick the next project. Baby girl afghan is what I want to do, but I don’t think I have quite the yarn I want for it yet. 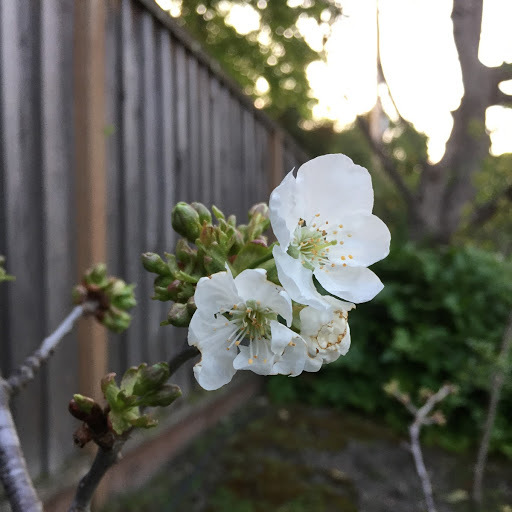 There are more blossoms on the Indian Free peach (the new Frost with the red limb spreaders is behind it) –and to my surprise, the first squash blossom. It’s not even in the ground yet but it couldn’t wait. I hope it’s spring where you guys are, too. Which means I really need to get to work on that cowl I cast on because I needed a carry-around project; no particular planning went into it, whatever yarn would do. Cameleon, in Malabrigo Rios. Summer in a ball. Cheerful stuff. It wasn’t in Anne’s colors, but Laura swooned. Which means I made sure I have her forwarding address now. That worked out well. 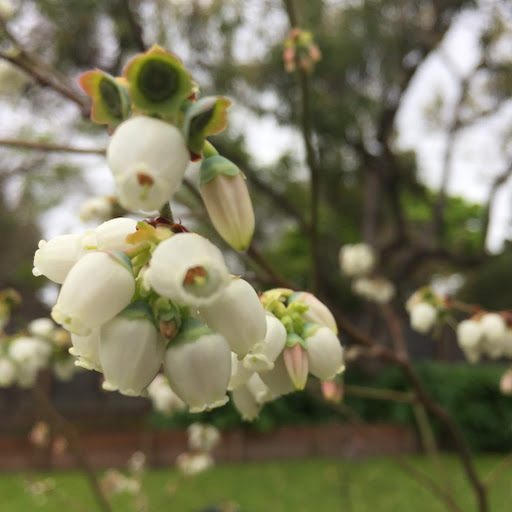 Meantime, the blueberries are blooming. First leaves and first figs–or to be technical, the breba crop, ie, that which is produced on last year’s wood and ripens early on without the heat of the summer to increase its sweetness, although for this variety they’re not far off from the main crop that comes later on on the new wood. You can always roast them and drizzle a little honey on. They’re just starting to show but there are already a lot more brebas than last year. There’s some knitting going on, too, but right now I’m just reveling in watching everything coming back to life. We woke up to 36F again this morning, which is so not normal for March. The historical average is 47F. I like that spring is, at least by daytime, steadily upstaging the unusual cold, bit by bit. 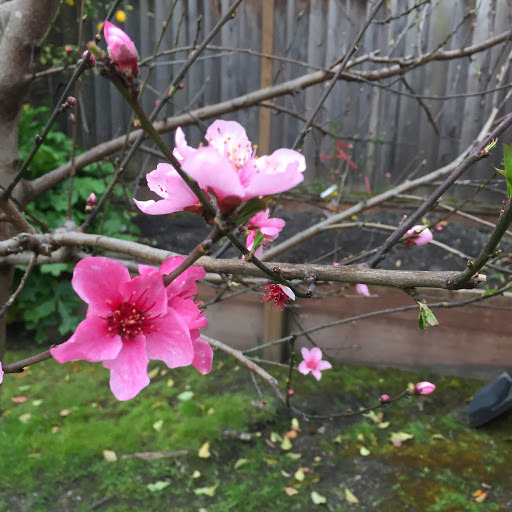 One new Frost peach tree with one flower and more to come. Yesterday, Garden Company in Santa Cruz had five of them. Today there were only three, so I was glad they’d offered to reserve me one. 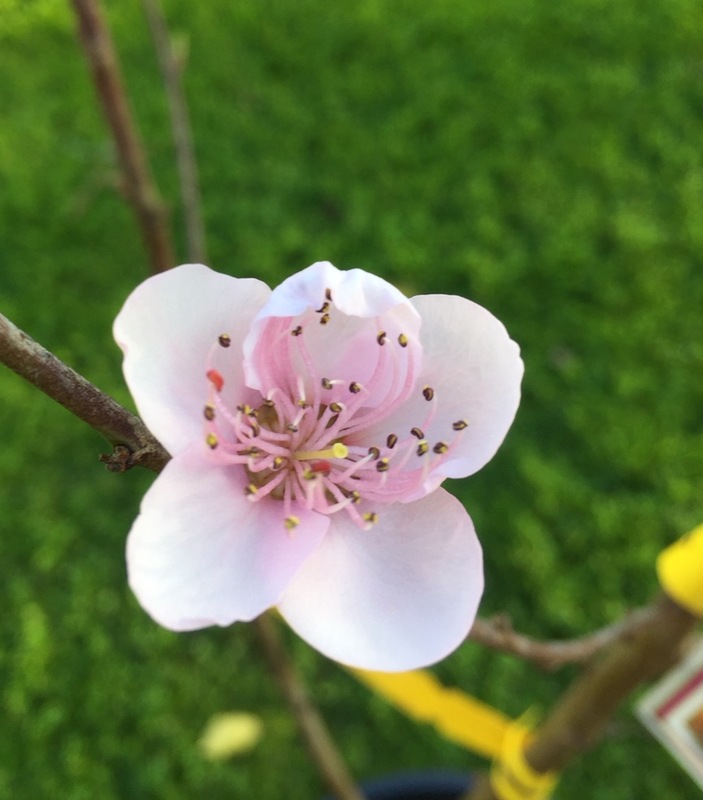 He knew who I was the instant I said Frost peach and he brought me over to the biggest and best-formed one, tagged with my name, just a beautiful baby tree in a pot. He warned me that the peaches on these were very large and could break limbs, and I felt as he said that how much what he sells and the people he sells to matter a great deal to him. 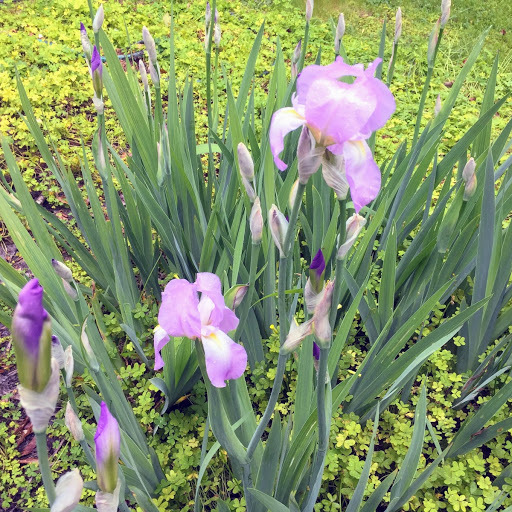 I said I’d have to be careful on thinning them to one each, implicitly promising him that I would, that I would take good care of it; he nodded yes. I told him the great Loring peach of my youth on the east coast doesn’t need thinning. But is it peach leaf curl resistant? Oh no, I shook my head ruefully. No it is not. And we both knew that disease was why I was here. There were two Frosts lined up behind that one. He pointed out that the one at the back, however, did have lower branching than the others. 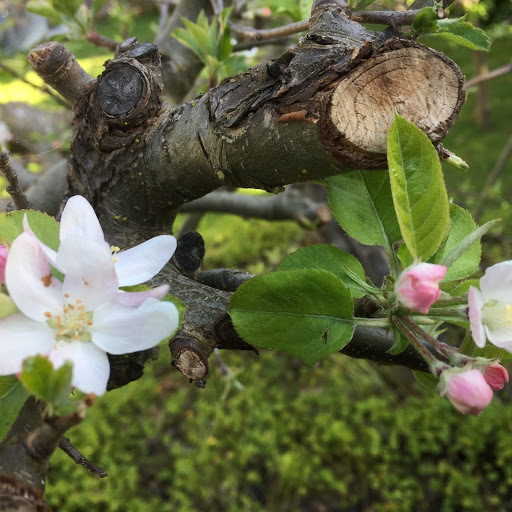 One of the side effects of our longer, warmer season is that things grow a lot and it can be hard to find a fruit tree whip that isn’t tall between the ground and the bottom limbs when you plant it. He wanted to make sure I knew I had that choice. I knew it would be easier to pick the fruit. And somewhat easier to keep the tree to a manageable size. Which was going to be an issue, because the variety was only available on semi-dwarfing, not dwarfing rootstock, and I’d seen how my Indian Free had taken off like a rocket on that Lovell. He pulled out the two in front so I could see it. Rather than limbs spread widely like the one with my name on it, most of them went pretty much straight up as if they’d been squeezed for sunshine. Not great angles. I was quite pleased that he had been saving me the best. And yet I took the smaller, thinner-trunked, slightly funky-leaning Charlie Brown tree after all. It won’t stay small long. It needs a little pruning to widen that out and definitely some limb spacers to push them apart. Someone else will get the perfectly shaped tree perfectly ready to go. Hopefully I’ll be glad for a long time to come that I chose this one. But I know that I’m really, really glad I bought it from these guys. What a wonderful place. 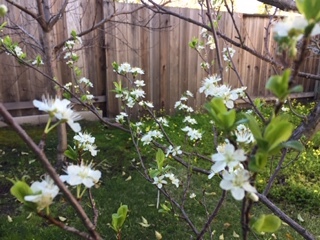 My Santa Rosa plum, a Mother’s Day gift planted by my kids maybe a dozen years ago. The second Alphonso fell into my hands. It is ripening for a few days inside and then I’ll deliver it as promised to Eli, the young man who took such good care of my mango for several years whenever we were out of town. He’s earned it, by his enthusiasm for that tree as well as all the bicycle trips over here. Already the aroma is starting to bloom. 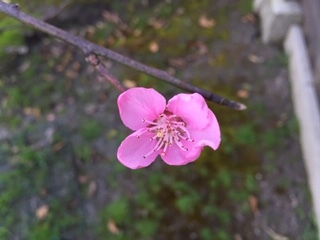 I called around, and this late in the planting season, the place I love in Santa Cruz still has the peach variety I want: Frost produces when my others don’t, it blooms when my Indian Free needs a pollinator, and it’s a yellow peach with a worthy flavor by all reports. 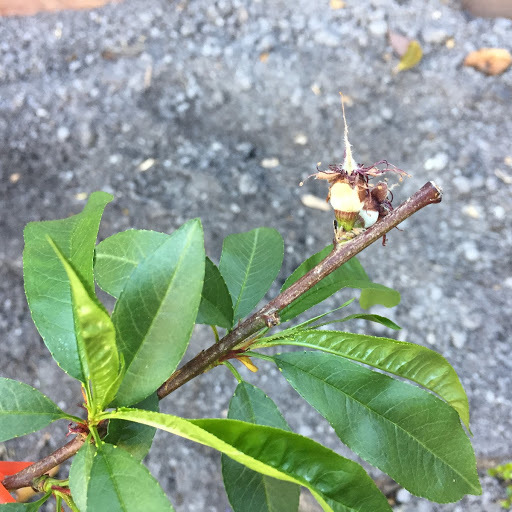 There was just too much rain and cold this year for my earliest variety: the Tropic Snow’s greening-out starts too soon to dodge peach leaf curl disease, which thrives on growing leaves in those conditions, and sprayed or not it still always gets hit. The effect was cumulative. We’re losing that tree and I’d rather not lose a growing season, so, out it will go and in with the resistant Frost variety. 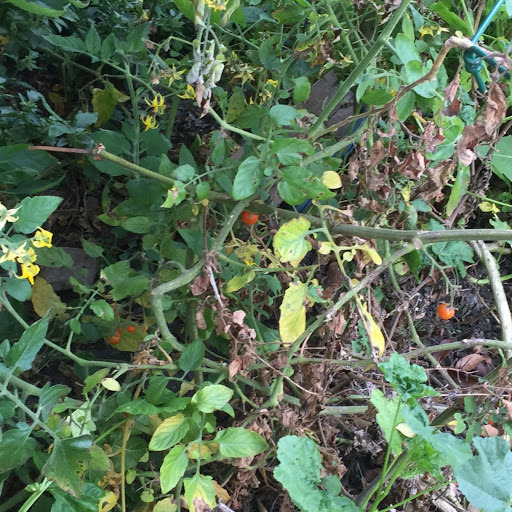 It’s too late for it, but I read last week on a gardening forum that the British a number of decades ago came up with a way of dealing with the problem. 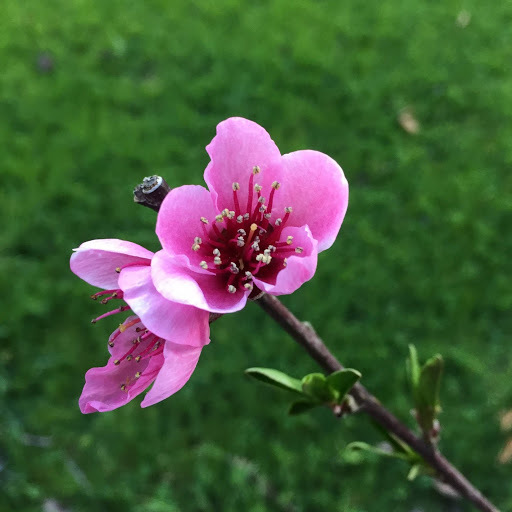 They plant susceptible varieties (and most peaches are) under the eaves of houses and espalier them there to keep them close, then cover the exposed side with wide rolls of plastic so the rain can’t touch them and the disease can’t make its way around the tree. And the word for that method? Since the critters ate some of my seedlings the rest of my starts have been kept safely behind windows for now. 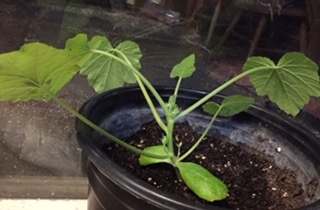 This squash is just plain ready to go: it’s already got flower buds. C’mon, Spring, hurry!